Calorie sunflower oil is 899 calories per 100 grams of product. 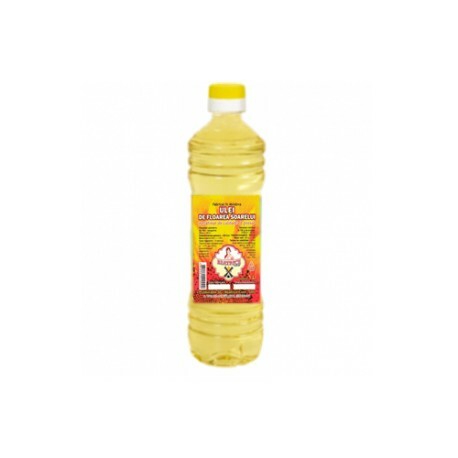 Sunflower oil consists of linolenic and linoleic unsaturated fatty acids which are not synthesized in the human body. These acids are called vitamin F or essential acids. The need for a human in them is even higher than in other vitamins. esterand and can be regarded as a means for prevention of atherosclerosis, myocardial infarction and other diseases of the cardiovascular system. Sunflower oil also contains vitamins: A, D and E.
The use of sunflower oil in traditional medicine. The healing properties of sunflower oil is widely used in traditional medicine in the treatment of thrombophlebitis, dental pain, chronic diseases of the stomach, intestines, liver, lungs. Refined, deodorized sunflower oil designed for hot, fried dishes. It is not recommended to fry using unrefined oil because at high temperature produces toxic compounds in it.